Don't feel bad ProfWag. I use Yahoo for my homepage too. I also like to read the headlines when I'm not too busy. As for your question as to why I would wear a ghillie suit to scare kids on Halloween? Oh baby! Do I LOVE Halloween! One year I pimped out this house so well it scared the crap out of the kids. I downloaded sound effects on my computer and rigged up speakers and lights and then sat in the dark house waiting to set off just the right sounds at the right times and the kids were jumpin'. Now that I think of it, I don't get too many trick or treaters anymore. Actually I have one mailperson who is afraid to deliver mail to my front door. I do have a black cat (a real one just like my avatar) that flies across my front porch when someone comes down the sidewalk and I usually let a few banana spiders take up residence on the house in fall. They're pretty big spiders. And they move fast when approached. It all adds to the allure. Now add me in a ghillie suit among a knee high lawn and I've got a party going on. NinjaPuppy wrote: As for your question as to why I would wear a ghillie suit to scare kids on Halloween? Oh baby! Do I LOVE Halloween! I actually meant for my comment to come across differently, but since it was a horrible joke to begin with, I'll just leave it. 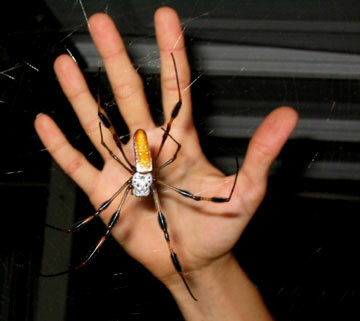 BTW, love me some banana spiders! Their ARE pretty cool and they remind me a bit of the camel spiders that often came to inspect my shoes when I was in the Middle East. Funny though, mortor rounds exploding nearby didn't seem to disturb those little buggers. Police officers testify to experiencing Bigfoot. NinjaPuppy wrote: Don't feel bad ProfWag. I use Yahoo for my homepage too. I also like to read the headlines when I'm not too busy.